A controversial former solicitor who served three years in prison for storing guns at his home in Linlithgow – for the Springburn-based McGovern family – has been back in court again. James McIntyre (58), of High Street, Linlithgow, was in the dock at Paisley Sheriff Court this week where he admitted the charge of acting in an abusive and aggressive manner contrary to the Air Navigation Order of 2009. McIntyre, who pens scripts for Eastenders and River City, was flying from Tenerife to Glasgow on August 25 last year when the incident took place. The court heard how he flew into a rage on board the aircraft after being told there was no butter for his in-flight meal. 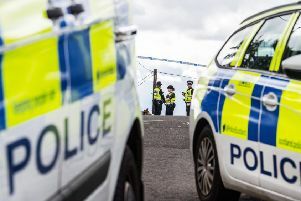 Paisley Sheriff Court heard how cabin crew on duty became so alarmed at his erratic behaviour they alerted the captain who, in turn, radioed ahead for police officers to meet the plane on arrival, when McIntyre was then arrested. When cabin crew advised him that the meals did not include any dairy spread, McIntyre blew his top. McIntyre claimed in court that he had been suffering from exhaustion and hunger. He was fined £800 for the offence.